St Thomas Aquinas, painted by Carlo Crivelli in 1476 (in the National Gallery, London). Although he is often shown with a sun on his chest (a symbol of sacred learning), and a pen, in Crivelli ‘s painting he has a book instead. And he is holding a church with chipped masonry and plants growing out of the brickwork. But its spire has been repaired. In the middle of the thirteenth century, an aristocratic southern Italian family had an ambitious plan for their son’s future. Thomas, born in 1225, was initially educated at the Abbey of Monte Cassino, which had been founded by St. Benedict. It was clear to Thomas’ parents that their son was focused in a special way on God, so they intended to use their influence to have him made Abbot of Monte Cassino, a position, they thought, fitting for the son of so noble a family. Before that could happen, Thomas needed to complete his studies. His father sent him to the University of Naples. It was there that he came across members of the new, dynamic and unconventional order known as the Dominicans or Order of Preachers. They inspired him greatly, and much to the disappointment of his parents, Thomas, joined them. He grew quickly in holiness and the knowledge of God, being nurtured by St Albert the Great who was one of his teachers. 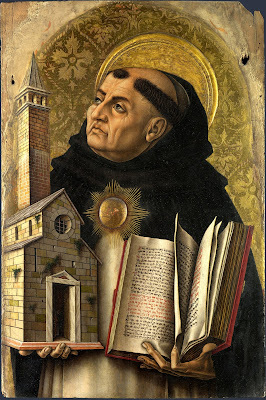 Eventually, Thomas became professor of Sacred Theology at the University of Paris at the same time as Bonaventure, who belonged to the Franciscan order. Thomas died in 1274. He is recognised as a Doctor of the Church and as one of the most influential Christian teachers of all time, believing that all truth is God's, and that we should seek its integration. His teaching had a strong influence on the Counci of Trent. Known primarily for his philosophical writing in his multi volume “Summa”, Thomas also wrote commentaries on various books of the Bible. Yet in his time he was chiefly known as a man of prayer who deeply loved the Lord, and followed him. Indeed, he had famously written, “Love takes up where knowledge leaves off.” It is said that even Thomas’ philosophical study was drenched with prayer, and that this enabled him to discern what was wheat and what was chaff in the ideas of his time, and then integrate the wheat into the Christian tradition. In particular, he showed how much of the thinking of the Greek philosopher, Aristotle, could be beneficial in the presentation of Christian theology, although his approach had its opponents. Thomas died in 1274 while en route to the Ecumenical Council of Lyons. We celebrate his feast today. And be blest for ever with thy glory’s sight. Amen.